I highly recommend this book. 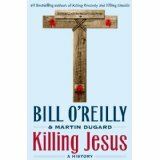 Put aside any political ideologies, and simply read this by an author who has been a reporter for many years and gives us this rare opportunity to explore the life and death of Jesus from a historical basis. As in the other books written by Bill O’Reilly and Martin Dugard, this book grabs your attention and gives you an additional account of an event that has impacted the world and our lives as none other. Follow the link below. Other books that I have enjoyed reading written by these authors that you might also enjoy are: Killing Kennedy, Killing Lincoln, Killing Patton.